A polio epidemic in 1916 accounted for 9,000 cases of the disease in New York City alone; in 1952 the United States recorded 58,000 cases of polio; by 1964, after the introduction of the Salk vaccine, 121 cases of polio occurred nationwide. Today, the only place to find an iron lung is perhaps in the local history museum in Tupelo, Mississippi. The Polio Journals: Lessons from My Mother, by Anne K. Gross, is the poignant and emotional account of one woman’s life as a polio survivor. Carol Greenfeld Rosenstiel, the author’s mother, contracted polio in 1927 at the age of two. From that time until her death from lung cancer in 1985, Carol Rosenstiel was paralyzed from the waist down. She married, raised two children, and had a successful career as a concert musician while confined to a wheelchair. She kept journals that Anne Gross used, after her mother’s death, to recount her mother’s life and her brave and unrelenting efforts to achieve acceptance in the world of the non-disabled. Gross has written more than merely the story of her mother and her family, for The Polio Journals is also the history of a disease that once terrorized entire communities as it killed and maimed children and adults seemingly at random and in large numbers. Polio was once thought to be an affliction caused by unsanitary living conditions and was thus a social stigma as well as a devastating disease. Carol Rosenstiel was the daughter of Eastern European Jews who already faced the problems often associated with such immigrants in the early years of the twentieth century in the US: poverty, lack of language skills, and anti-Semitism. To be afflicted further with the burden of caring for a daughter suffering the aftermath of polio was devastating. Gross does a superb job in describing her grandparents’ efforts to encourage their daughter to build a “normal” life in spite of her handicaps, as well as the toll those efforts exacted on the entire family for generations. The author is a clinical psychologist who has spent a career treating persons with disabilities and chronic diseases. Gross draws on her training and experience to interweave this story with commentary from experts in various related health care fields and this material gives richness to the book that makes it more than memoir. American society has generally come a long way since the 1920s in terms of how the disabled and chronically ill are treated. 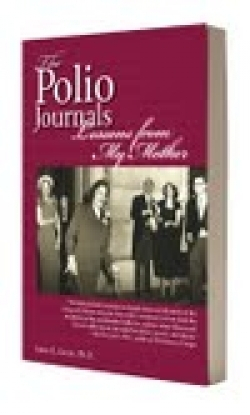 The Polio Journals illuminates that path of progress and sheds light on how far there is yet to travel.